Mostly cloudy start to the day as a storm system approaches the region, we will remain dry this morning but precipitation is in route. Rain looks to overspread the region after 3pm from west to east, a look at the short range guidance shows that the precipitation looks to be scattered, with periods of rain impacting the during the overnight. We remain warmer today into tomorrow morning, but a cold front will pass through the region tomorrow with colder air pouring back into the region by Friday night. The weekend looks to be breezy and below normal in terms of temps, but with the exception of some rain and snow showers Sat night it also appears dry. Easter Sunday looks to deliver below normal temps combined with some Nw winds, the combination will result in a feeling of early March weather. Looking further head it appears winter will not release its grip on the region. Blocking in place in the North Atlantic will help to keep the NE in a trough pattern, this will in return allow cold air to continue to pour down from Canada. Below normal temps, and even more wintry weather looks possible for the first half of April. Temps overnight managed to remain above freezing across most of the lower elevations, although you can see from our station in Hurley NY, we got pretty close to an icing event with 33° registering on the graph. A glance at the morning radar indicates that freezing precipitation has persisted across the higher terrain, so slick travel is a definite concern across the Catskills this morning, use caution across Sullivan,Delaware,Western Ulster and Western Greene Counties. Preciptiation will pull out of the region over the next few hours leaving us with a mostly cloudy but dry day. Our next weather maker will be an all rain event Thursday evening into Thursday night. Changes are apon us, high pressure that has controlled our weather is now forecasted to exit the east coast. As the high pressure slides east it will turn our flow from the colder NW to the warmer southern direction. As the warm front approaches the region it will break out some precipitation as well, the airmass is place is a bit dry so precip will like fall as virga but as we head into the late evening and into the overnight the precipitation will begin to reach the ground. There is still some question on just how cold the valley floor can get tonight and how long the colder air aloft can also hold on. The answers to these questions will determine if precip falls as plain rain or a wintry mix. 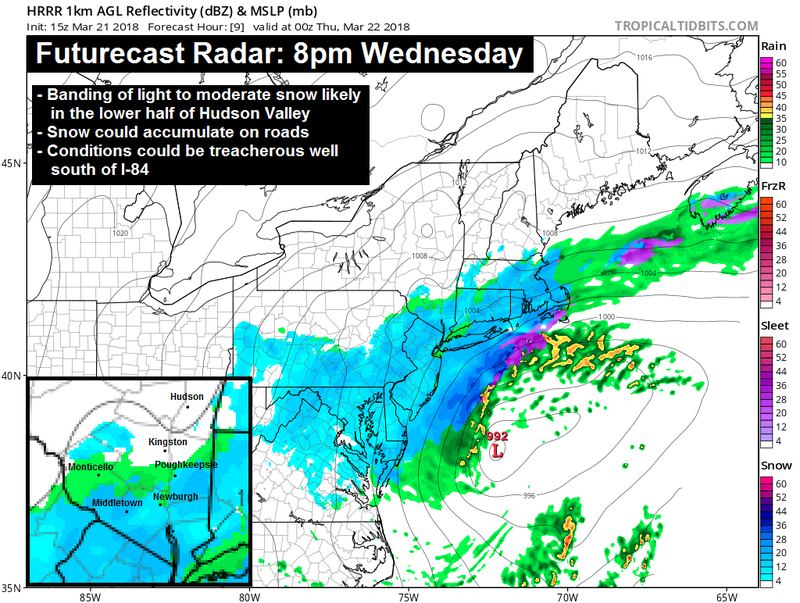 It appears quite likely that the higher terrain areas, especially the Catskills will see a period of freezing rain and sleet that will persist through the overnight and into tomorrow AM, travel impacts here are likely. Across the lower elevations, warmer surfaces may air in limiting and dangerous ice accretion, as we head into Thurday morning we will see precip turn to all rain as warmer air finally erodes any remaining stubborn cold air. If traveling overnight tonight into the early mornings hours especially across the higher terrain or typical colder spots ie sheltered valleys, or hill towns, please be prepared for the potential for icy spots. We will monitor things closely today and see if we are trending on the colder or warmer side of things, as this will help determine if the icy conditions will impacts the entire region or only the upper elevations. A cold but beautiful start to the day as high pressure controls our weather through tomorrow. Despite a cold start our March sun will help get temps into the mid 40’s by this afternoon. Tomorrow will have a similar start, the subtle changes to our weather will begin in the form of our wind direction shifting to a more southerly flow. This will allow warmer air to infiltrate the region by tomorrow afternoon, unfortunately the warm front also has some moisture associated with it. On Tuesday night we will need to keep a close eye on the potential for icy conditions across the region, this will depend heavily on how much of our current cold air mass can stick around as the warmer air surges in above it. Right now the biggest threat for freezing rain exists in the higher terrain, but a period of wintry mix and freezing rain is still possible to the valley floor. We will have more on this in our next update, everyone have a great day! A quiet but cold start to our weekend. Partly to mostly sunny skies will be the story of the day, but our northerly flow will keep it quite cold for this time of year. Highs will struggle into the low and mid 40s. So make sure you grab your winter gear, as our cold pattern looks to last into the start of next week. We’ll have a weak disturbance slide southward from New England overnight and spread some light snow showers in parts of the area before sunrise on Sunday. We are not expecting widespread problems, but something to watch out for in the early morning hours. Have a nice Saturday afternoon! In the wake of our ‘almost snowstorm’, temperatures really warmed up on Thursday… into the mid and upper 40s… and melted almost everything in just the matter of a few hours. Today, late winter’s chill will try and hold on for dear life, as we have high clouds filtering our sunshine. Temps will be below normal again today, as highs climb only into the low and mid 40s today. We are watching a northerly flow try to usher in some slightly cooler temps… as well as a few snow flurries and rain sprinkles. This could briefly dampen the situation across parts of the region, especially the northern HV and Catskills. But in general we look dry and chilly today. There was some buzz about a Sunday storm in or comments the past few days. We aren’t sure where that started, but there is no storm threat. We could see a few snow or rain showers rotate out of New England, as an ocean storm influences our weather… but there is no storm on the horizon for the next several days. This month has featured 4 nor’easters that have impacted the Hudson Valley in one way or another. Unfortunately or fortunately… depending on your perspective… the end result hasn’t really been representative of the time and effort that went into forecasting the storm. Case in point… our storm from Wednesday. Yes, this guidance suggested a MAJOR impact in the Hudson Valley, just hours before the storm was to begin. So while we were crunching data, and weighing our ideas on what the actual snowfall forecast should be… trying to shrug off information like this, was not so easy to do. So yes, the Hudson Valley only saw a minor event on average… with our viewers from the lower Hudson Valley (Rockland & Westchester counties) seeing a sizeable impact event, with around 6 to 8 inches in some spots. When we weigh out the result… against what our forecast was… our forecast actually performed quite well. 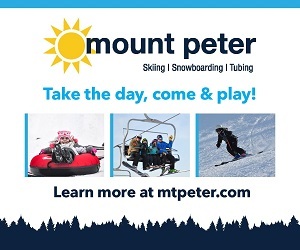 Most schools and many businesses closed early or didn’t open at all on Wednesday… despite the fact that the snow never came until after dark. 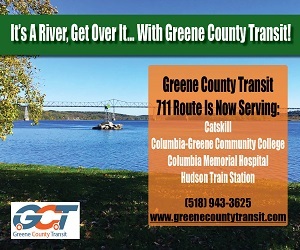 So it caused much frustration and even some anger across the Hudson Valley, as claims of a ‘bust’ began to ring loud and true. 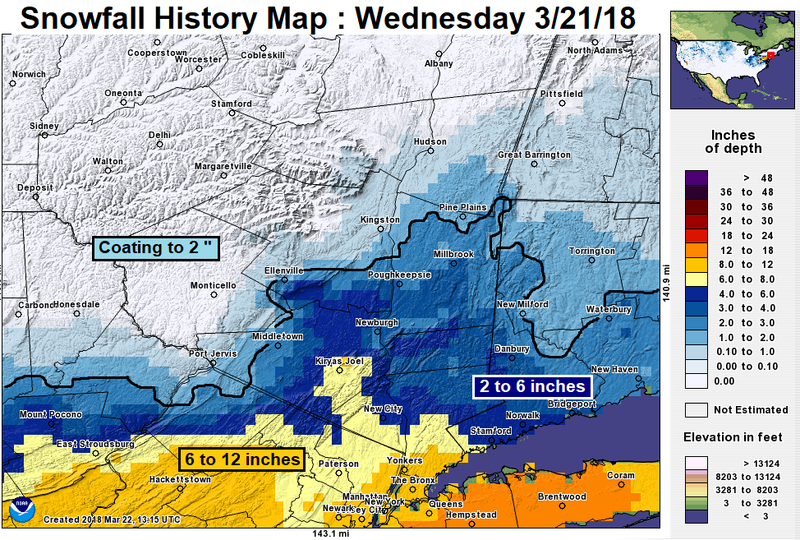 But our forecast was never for a major impact in the Hudson Valley… and the widespread 2 to 6 inches that we projected over the Mid Hudson Valley actually came true. So the storm certainly wasn’t what some people expected… probably because the news networks were in a frenzy, talking about the storm that did drop a foot or more on the metropolitan area. But locally… the storm was yet another ‘near miss’, that had light to moderate impacts on the Hudson Valley. The clock on winter is ticking… we’ll see how much time is left on the clock, before the final buzzer on the winter season goes off. 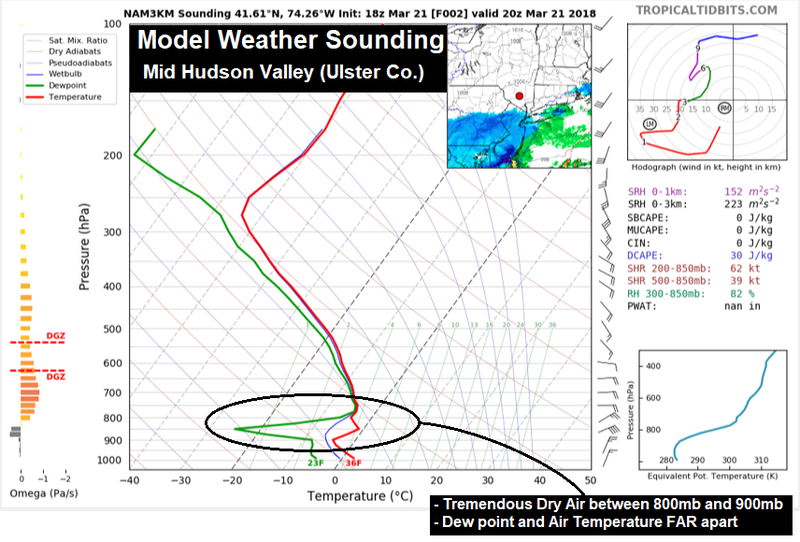 For roughly 10 hours… moderate to heavy snow fell from the skies across the Hudson Valley today… only to evaporate in the dry air before reaching the ground. 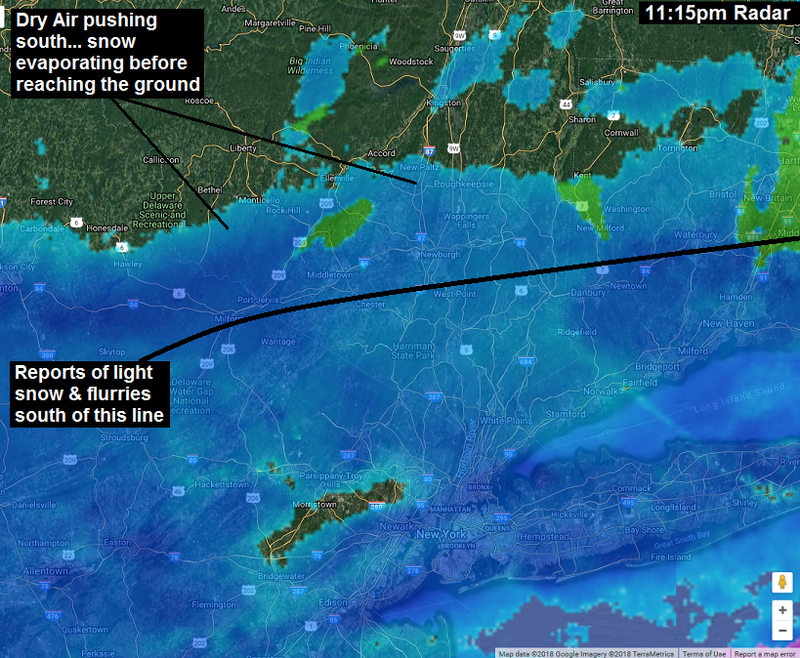 However between 8pm and 11pm… the snow FINALLY began reaching the ground across the Hudson Valley. You can see on radar that we have light… to locally moderate… snow across the Hudson Valley. The snow is rotating counter clockwise around the coastal low pressure system that has been spinning all day off the east coast. We have reports of 1 to 3 inches of snow across the Mid Hudson Valley, and higher amounts as we push southward into Putnam, Rockland and Westchester counties. After being dry all day, roads are now snow covered and icy in many areas… so be alert that the Thursday AM commute may be a slick one. Winds will also continue to gust out of the NE at 15 to 30mph, so be sure to hold onto your hat when you’re outside. This storm was advertised by HVW as a major uncertainty. We could have just as easily seen widespread 12 inch totals across the region from this storm, based on the data we were looking at leading up to the storm. Our coverage was thorough and highlighted the sharp cut off that was expected, the chance for a ‘rip off zone’ that ran straight over the middle of the Hudson Valley. There were so many factors with this storm, that we put out our forecast of 2 to 6 inches across the central HV, dand then spent the rest of our time showing you how that 2 to 6 could easily become a dusting to an inch… and how 2 to 6 could easily become 12″+. These complex storm systems require complex explanations & forecasts. While the vast majority of HVW viewers understand and appreciate this… we’re trying to reach those who have been harshly critical of us today. We hope that as this storm wraps up over the next few hours, it becomes a bit more clear to some critics, just how complex this dynamic system was to forecast. If you look at the radar… this storm looks like it’s really coming down across the Hudson Valley as we approach sunset. Unfortunately, that’s just not the case. Despite the moderate (dark blues & light greens) to even locally heavy (dark greens & yellows) snowfall returns coming in on radar… there is a patch of VERY dry air in the mid levels of the atmosphere. The result is that despite a very active radar… virtually no snow is reaching the ground north of Putnam and Rockland counties. Now this sounding has a lot of information on here that likely means nothing to most people, but the sounding is a useful tool for us to take a snapshot cross section of the atmosphere. The key take away are the red and green lines. The red line represents the air temperature from the top of the atmosphere, all the way down to the surface (1000mb on the left side of the graph). So it’s 36°F at this location. The dew point is 23° at this location, and so the air is quite dry. When dealing with a snow event, the dew point and the air temperature need to be fairly close… because we’d want to see humidity levels around 70% to 80% on average to get the snow to reach the ground. But as dry as the air is at ground level… just go up into the atmosphere a bit, to around 850mb. Notice how the red and green lines go in opposite directions from each other. The further the lines are away from each other, the drier the air is, and the closer they are, the more humid the air. At 850mb (just below cloud level) the dew point and air temperature are over 20 degrees Celsius apart! The air is EXTREMELY DRY! Because if you notice, if you go up a little higher in the atmosphere, to 700mb… the red and blue lines are right on top of each other, roughly 100% humidity. The air is PLENTY moist enough to support the snow. This is the entire problem… and it was not accounted for by any of the earlier computer guidance. The end result, is likely the following… if you haven’t seen snow yet, you’re likely not going to see any snow from this system. That’s the truth of the matter, ladies and gentlemen. The air is just much too dry to erode that much dry air. Even with moderate precipitation falling into that dry air… it’s not moistening the air fast enough in most locations. So pretty much anywhere north of I-84, is likely to see no snow at all from this system, as a result of the dry air. 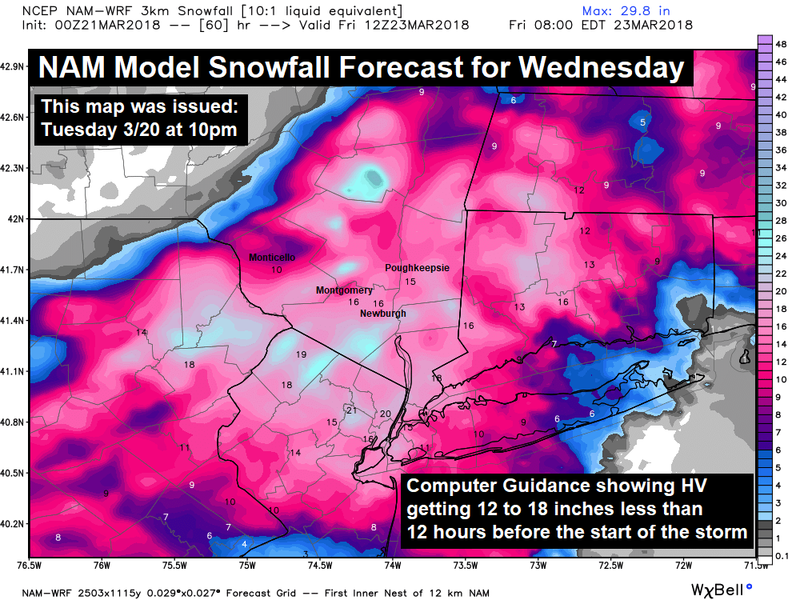 Those areas weren’t going to see much anyway… but instead of 2 or 3… maybe 4 inches in places like Kingston, New Paltz, Poughkeepsie and Monticello… you’re likely going to see zero inches. Now… in some parts of the Mid Hudson Valley, the snow will win out, and moisten up the atmosphere enough. There will be places where light to moderate snow falls tonight, near the I-84 corridor. The best chances will be for areas east of the Hudson River, but it’s really contingent upon banding of the snow. Where the heavier bands set up on radar, will determine where the best chances of snow falling are. It wouldn’t surprise us to see someone get a couple inches in parts of southern Dutchess county. This map may be a little too pessimistic, but you get the general picture. All the accumulating snow is focused near and south of I-84… because the magnitude of the dry air is just so strong. So anyone near or south of I-84… expect snow to develop if it hasn’t already… and an inch or two is likely near the I-84 corridor. As you go further south, into zones 8 & 9 (Rockland, Putnam and Westchester), an additional 2 to 4… maybe 5 inches of snow could fall tonight. That would be enough to get those areas into the low end of the forecast range… but it is certainly a possibility there. The dry air has completely evaporated this snowstorm for the Hudson Valley. There will be some snow tonight in the Mid Hudson Valley and points south, but exactly how much depends on the resilience of the dry air. Unfortunately, it’s extremely difficult, if not impossible, to tell just how long the dry air will hold ground. Most indicators are that it will give way to the moisture and snow will fall… but there is uncertainty for sure. We’ll have more updates as the night continues. This storm is not pulling any punches. Not only was it a major challenge to decipher where the banding of snow would set up… we’re now trying to iron out if and when this dry air will ever ease it’s grip on the Hudson Valley. The radar looks great for the southern half of the Hudson Valley at this hour… but the observations tell a completely different story. Everything north of the black line is evaporating before reaching the ground… because the air is so incredibly dry across the Hudson Valley. So areas like Newburgh, Middletown, Montgomery, Fishkill, even Poughkeepsie… it may look like the snow is falling or is about to fall… but it’s really just cloudy, breezy and cold. The dry air was always a concern for the northern Hudson Valley and Catskills… where it’s safe to say there will be no snow from this system. those areas will officially see nothing. We were always skeptical of the snow pushing into those areas, and it’s all but been confirmed now, that the snow will never reach the Catskills or the northern Hudson Valley. there we have added another wildcard factor, in the form of very dry air. The snow band has pushed into parts of this area on radar… but the dry air is causing it to evaporate before reaching the ground. As the snow continues to fall into the atmosphere, it should moisten the air and begin reaching the ground at some point… but exactly when, is anyone’s guess. Our latest guidance suggests that as the storm rotates eastward tonight, it will swing bands of moderate snow northwestward… into the Hudson Valley. So periods of snow are certainly possible late this afternoon and tonight… but the strength of this dry air is the wildcard. Those areas still stand to see a decent snowfall from this system. The snow has eroded much of the dry air in these areas, and you’re now looking at 8 to 12 hours of steady snowfall. As a result, as these bands of snow rotate in, snowfall rates could exceed 1 inch per hour at times. We think a general 4 to 8 inches is likely… with some areas possibly reaching 12 inches down by I-287. The extreme southern Hudson Valley could see someone come in with a foot of snow. We spent 2 solid days trying to drive home the unpredictability with this storm system. We published our snowfall forecast, but really did not want to focus on the totals… because there were just too many variables at play. Figuring out the exact progression and cutoff of the northern edge of the snow, was always going to lead to areas getting “ripped off”… but the question was exactly where. A lot of schools closed today… and the rest opted for early releases… and it’s very likely that not a single flake will have fallen by the end of the normal school day. “Wait and see” was a message we tried to convey, to minimize the number of cancelled and altered plans in areas where the weather remained cloudy and dry. This storm got a LOT of air time from the news networks, because the NYC area stands to get clobbered by this system, along with the southern most portions of our viewing area. But the northern half of the viewing area was never expected to be majorly impacted by this storm… and we did our best to communicate that. When dealing with such complex and complicated storm systems… it’s crucial to listen to the details of the forecast… especially when the forecasters are emphasizing the conflicting data and uncertain data that they’re seeing. This storm isn’t over… not by a LONG shot. Now, for some parts of the area (Catskills & Northern HV), this was never your storm to begin with, so we’re not talking to you per say. However, in the mid and lower Hudson Valley… you need to keep watching this storm. It may not have done what you expected so far today… honestly, it wasn’t expected to do all that much by this point regardless… but we need to watch as this system wraps up off shore this afternoon. The low pressure will sit and rotate off shore for the next 12 to 18 hours… and as it does, it’s expected that bands of snow will rotate in NW off the ocean. So you see… there will be snow to contend with for many parts of the Hudson Valley later today and into tonight. So we’ll have more updates as the day progresses. We mentioned on Tuesday in the evening live stream, that this storm reminded us of the blizzard a few years back that shut down the Hudson Valley. That storm also expected a sharp cut off across the mid-Hudson Valley, and we weren’t sure exactly where it would be. In that storm, Montgomery and Newburgh got 0.0″ of snow… but a half hour drive to your south… in Warwick, they saw 12″ of snow. When all is said and done, this storm will likely look a lot like that… we shall see. No major changes to the preliminary forecast… mainly because we have not seen anything to increase or decrease our confidence levels. This forecast provides a good starting point for what to expect with this storm, however there will be some surprises as the storm begins to unfold early on Wednesday. Many of us will need to roll with the punches as we ‘now-cast’ on Wednesday morning. This simulation suggests that the snow makes it just about to I-84, before stalling out. Once the snow’s northward progress stalls… the snow shield begins to rotate and pivot around the low pressure off shore. So in this situation, we’d be looking at 4 to 6… maybe 8 inches of snow from I-84 on south, while there is literally NOTHING north of there. 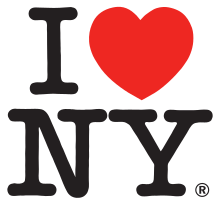 The suggestion is that Long Island and NYC get absolutely CRUSHED… which is certainly possible. But over the Hudson Valley, notice the dramatic cut off. The suggestion is that Delaware, Sullivan, Ulster and Greene counties get nothing… not even a snowflake. But zone’s 8 & 9, would fall safely within the 6 to 12 inch range projected. 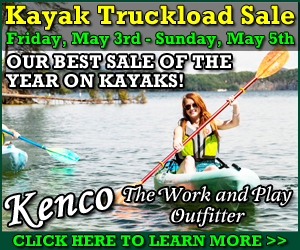 So once again… the Hudson Valley is ground zero for the rip off zone. So when you look at our forecast, the 6 to 12 inch range in zones 8 & 9 are the areas we feel best about. 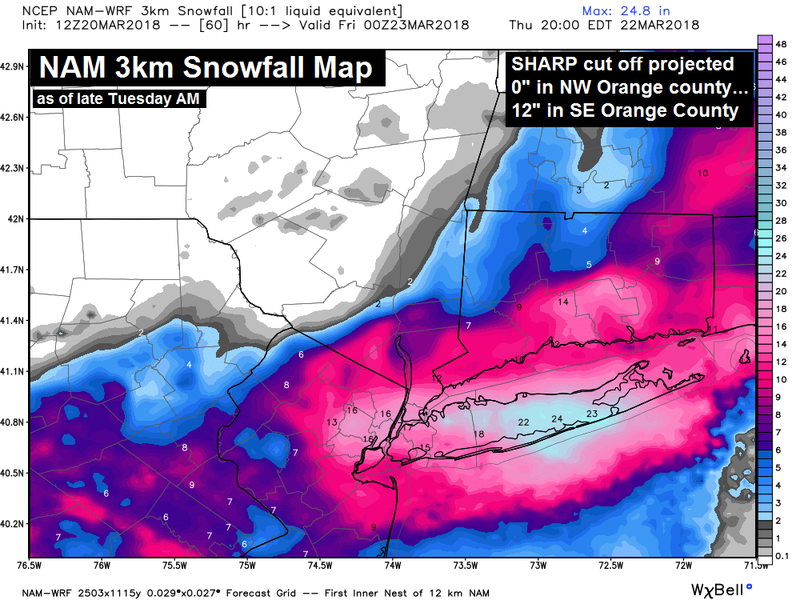 Odds are decent that as the storm pivots before moving east… that the deformation snow bands that could produce snowfall rates at 1 to 2 inches per hour, could impact Rockland, Putnam and Westchester counties. Those areas need to be prepared for a significant snow event… and it’s possible that those areas could even exceed the forecast range. 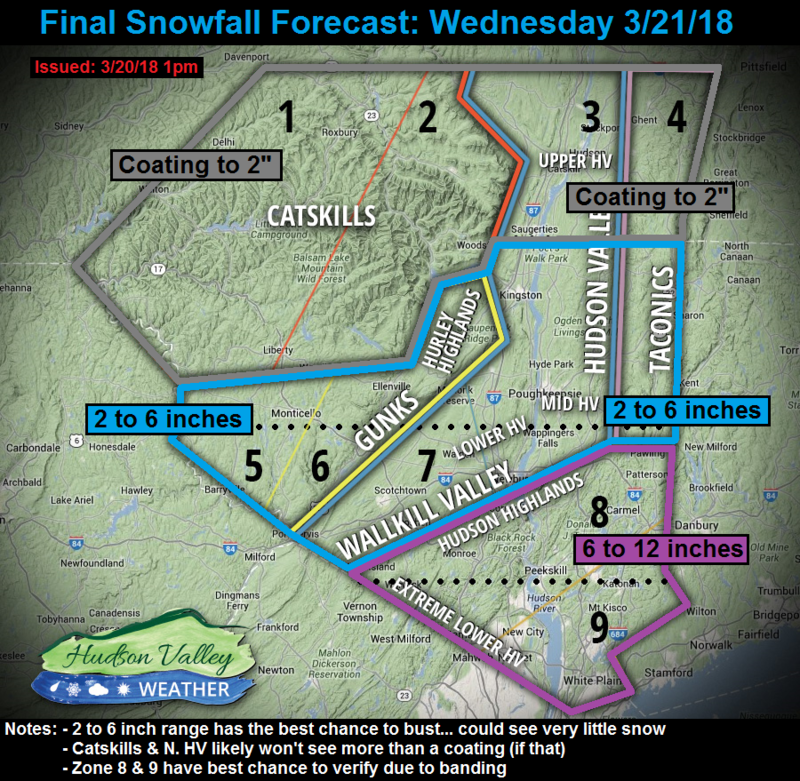 The Catskills and northern Hudson Valley (zones 1 & 2… as well as the northern half of zones 3 and 4), are likely to see little if any snow at all. We projected a coating to 2 inches… but that is really being optimistic, and assuming the scenario where this storm really hugs the coast. As you can see by the simulation above… odds are quite high, that the northern HV and Catskills will be cloudy and cold… with barely any snowflakes at all. We wouldn’t be surprised at all if most everyone in this region saw 0.0″. 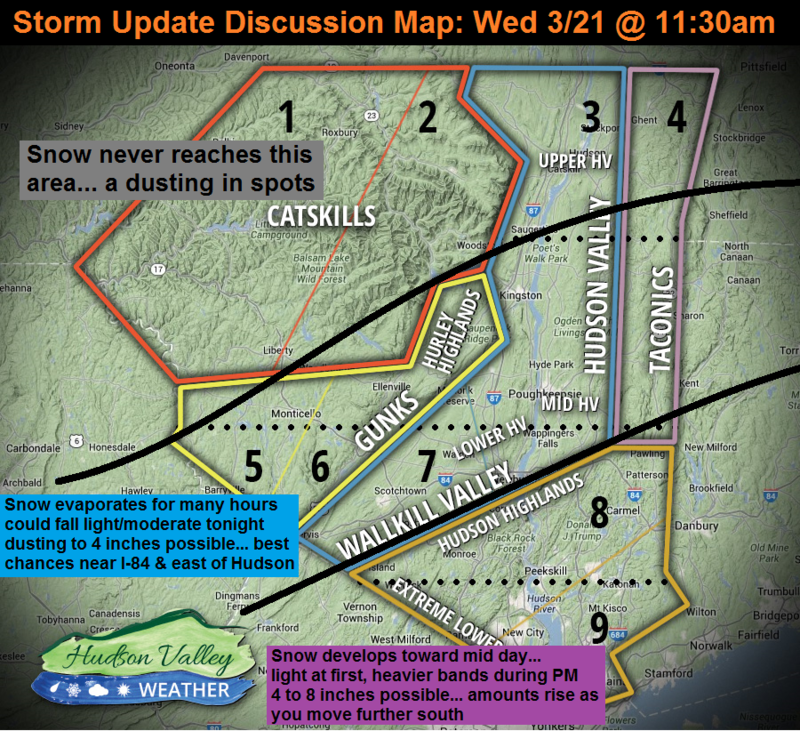 The Mid Hudson Valley is the most complex part of the forecast hands down. To say we don’t feel good about this region would be a big understatement. We have 2 to 6 inches projected, because we have it as the dividing line between “snow and no snow”. As the expected northwestern edge of this storm, with a dramatically sharp cutoff expected… this area has BUST written all over it. The further north you go, the more likely you are to see no snow at all. The further south and east you go, the better the chances you see accumulating snowfall. The question is… how much snow can you see in this area? It’s a brutally tough call… and no matter how much data we crunch, we’re guessing at where the cutoff sets up. We are going to use our historical experience, which tells us that these upper level low pressure systems always tend to track further NW than expected. So with that logic, it wouldn’t surprise us if the accumulating snow reached back toward the base of the Catskills. But even then… are we talking about a dusting to an inch?… or 4 or 5 inches? Who can be sure. We’re going to have to ‘now-cast’ this event, especially for this area. And as we get a better understanding of how dry the atmosphere is, what the position of the low pressure is, where the banding sets up… we should be able to begin honing in on snowfall totals in this area. Expect snow to interrupt your Wednesday plans anywhere from Monticello to Ellenville, to New Paltz, to Poughkeepsie. But it’s also entirely possible that the day is gray and dry…. it’s just too close to call with certainty. 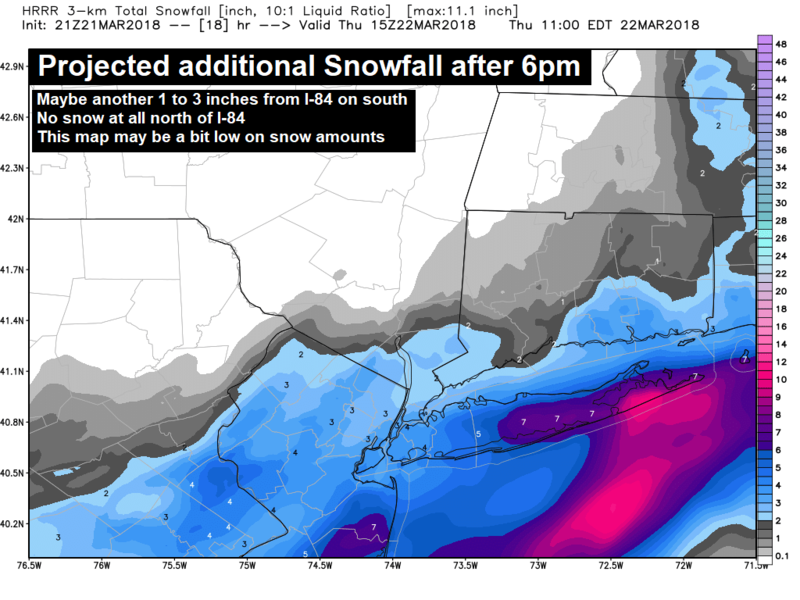 In terms of impacts… the SE Hudson Valley (Rockland, Westchester and Putnam counties… as well as Eastern Orange to some extent) could see considerable impacts. NE winds will pick up and gust over 25mph at times. If we get into the deformation band, and snowfall rates are 1 to 2 inches per hour… that heavy, wet snow, will likely coat trees and power lines. Factor in that wind, and we could be talking about power outages once again, in areas that have already been hit hard this month. Trying to look at the bright side… with the nor’easters so far this month, most of the weak tree branches should have already been taken out. So in terms of total power outages, lets hope the numbers are down, because the more susceptible trees and power lines have already been eliminated, and what remains are stronger trees and branches that can handle the extra weight and stress that results from the snow and wind. We can hope. 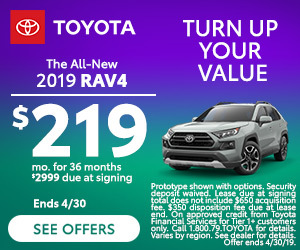 We have our hands full… there is no question. 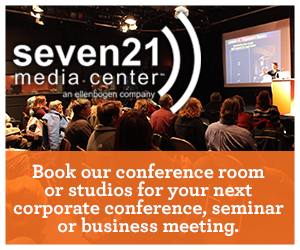 We’ll have updates and discussions all the way up to the event. 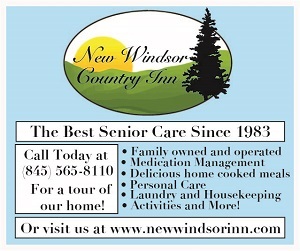 As we begin to see things that concern us, we will pass the information along to you. If we feel that some areas will see substantially more or less snow… we’ll let you know. It’s a complex storm track, with an upper level low, and the dramatically sharp cutoff is right over the Hudson Valley. 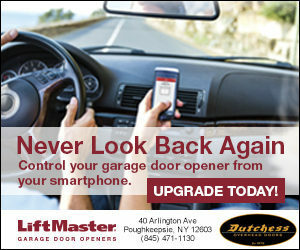 Buckle up for a bumpy ride, Hudson Valley!